Admire the elegant and transitional design in the new TV Bench from the Jackson Collection by CorLiving. This timeless staple item is featured in our Espresso finish accented with imitation nickel handles and 4 cabinet drawers. Offering a variety of open and concealed storage options this timeless bench is perfect for all of your A/V components and accessories and can accommodate most TVs up to 80". Easy to assemble so you'll be set up in no time. A storage ottoman can be a lavish touch to any home dicor ensemble, but this ottoman is truly a one of a kind statement piece. With magnificent faux leather upholstery, a beautiful diamond patterned stitching detail, and sparkling crystal button tufting, you'll think this piece came straight off of a fashion runway. Add to it the cabriole style legs with a chrome finish and this ottoman is sure to dazzle from any angle. Attention to detail is in all of the finishes as it includes a deep multi-purpose storage compartment and safety stop hinges to ensure that closing this ottoman will feel as soft and luxurious as it looks. Whether using it for storage or plush seating, this ottoman is sure to turn any ordinary room into something palatial. Perfect for the end of a bed to add some bling to your bedroom. Or place a clear tray on top and use as an elegant coffee table. Make a fashionable impression with the Veneto tufted accent bench. Covered with a durable and easy-to-maintain 100% polyester fabric, this elegant upholstered bench has a luxurious velvety feel. Chic acrylic legs add a contemporary edge that complements the neutral grey colour and mixes effortlessly with any existing decor scheme. Tufted accents add to the sophisticated look and a nail-head trim enhances durability while drawing the eye with a touch of timeless style. Place this comfortable and versatile bench in an entryway, at the foot of a bed, in front of a window or anywhere in your home where you require additional seating or a stylish accent piece. The contemporary rustic styling of the Acadian Collection complements and completes any living or great room setting with handsome crown moulding along the top, grooved door and drawer panels, rounded square brushed nickel hardware and elegantly tapered feet. The collection is made from plantation-grown pine that is finished with a light brown stain and durable lacquer top coat. Add an elegant and functional furniture piece to your entryway, or any other room in the home with the Acadian Entryway Bench. This sturdy and stylish bench offers convenient seating for putting on shoes. Open the flip up lid to a large storage compartment in which your shoes can be stored. TJK-682-B Jackson Extra Wide TV Bench in Espresso Finish Admire the elegant and transitional design in the new TV Bench from the Jackson Collection by CorLiving. This timeless staple item is featured in our Espresso finish accented with imitation nickel handles and 4 cabinet drawers. Offering a variety of open and concealed storage options this timeless bench is perfect for all of your A/V components and accessories and can accommodate most TVs up to 80". Easy to assemble so you'll be set up in no time. 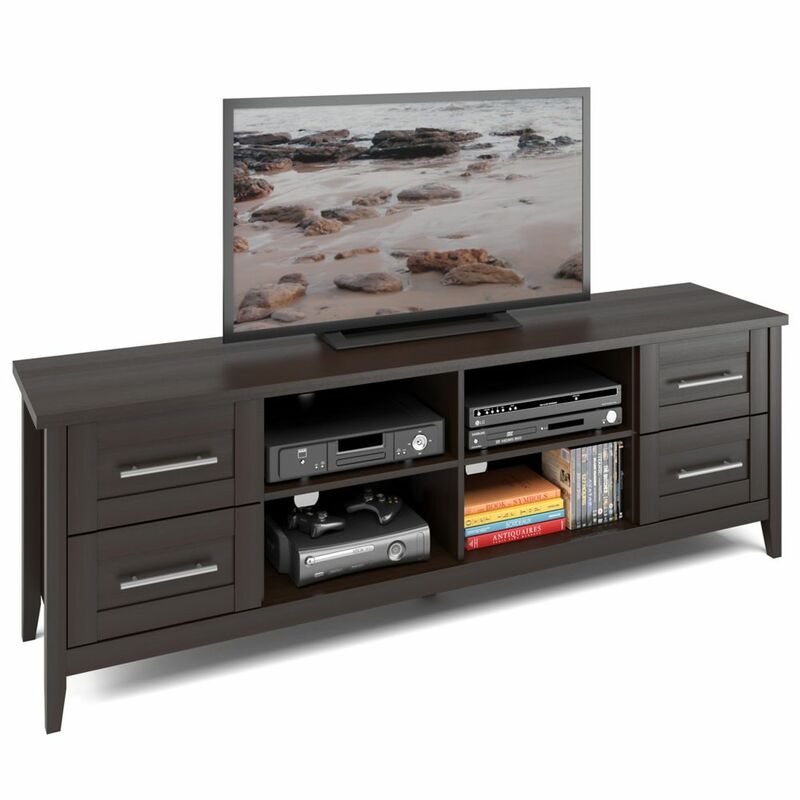 TJK-682-B Jackson Extra Wide TV Bench in Espresso Finish is rated 4.0 out of 5 by 1.